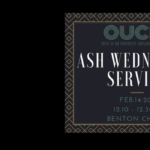 All Faith Chapel for meditation, weddings, Services of Holy Union, and other spiritual/religious events or observances. 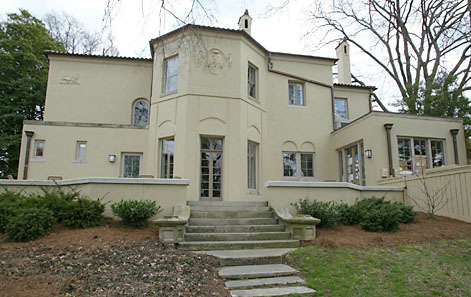 The Office of the University Chaplain and Religious Life is located in the former chancellors mansion and former Community Partnership House. We are located behind the Branscomb dormitories on 24th Ave South. From the opposite direction, we are located behind the University Club. There is a small lending library available to members of Vanderbilt’s campus community. 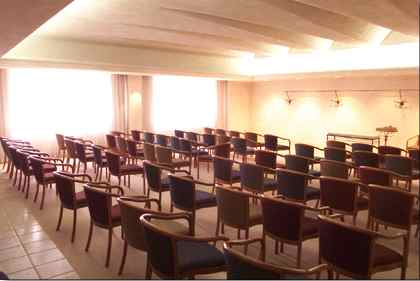 The Fireside Lounge can accommodate meetings of large groups of people and be used for liesure, television viewing and movies. Our conference room has space for twenty or more and there is access to a flat screen television that accepts Power Point feed for presentations. Our entire building is Wi-Fi enabled. If you would like to reserve one of our office spaces, please give us a call. 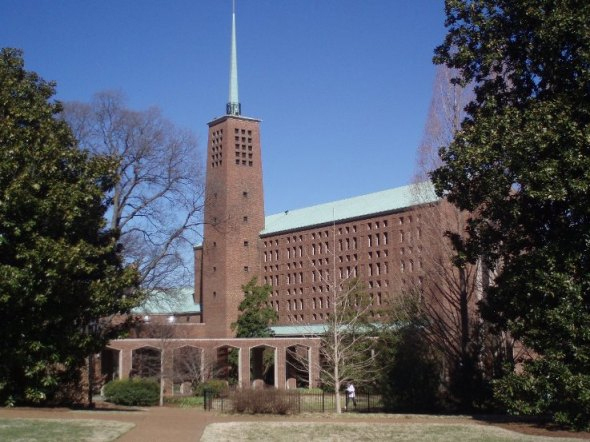 Benton Chapel is part of the John Frederick Oberlin Divinity Quadrangle, built in 1959 and later named to commemorate the 1966 merger of Oberlin College Graduate School of Theology with Vanderbilt Divinity School. 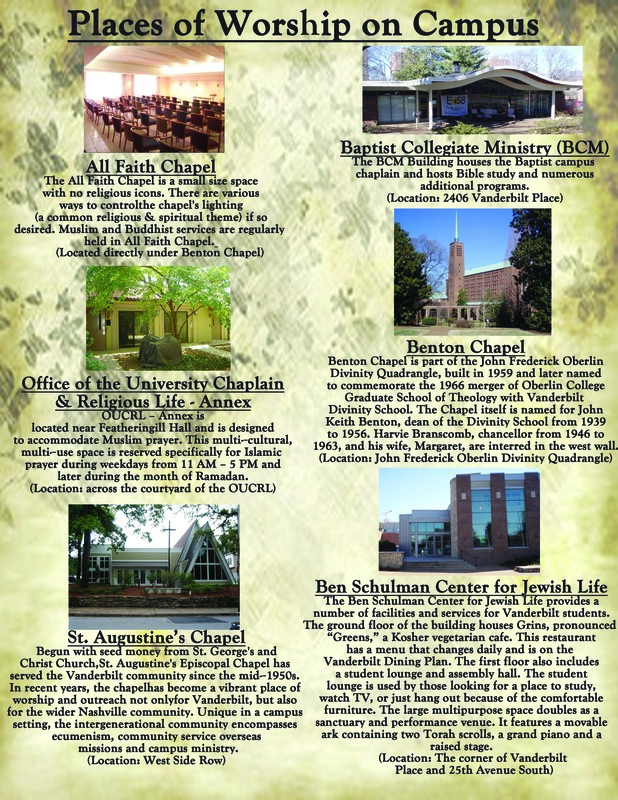 The Chapel itself is named for John Keith Benton, dean of the Divinity School from 1939 to 1956. Harvie Branscomb, chancellor from 1946 to 1963, and his wife, Margaret, are interred in the west wall. 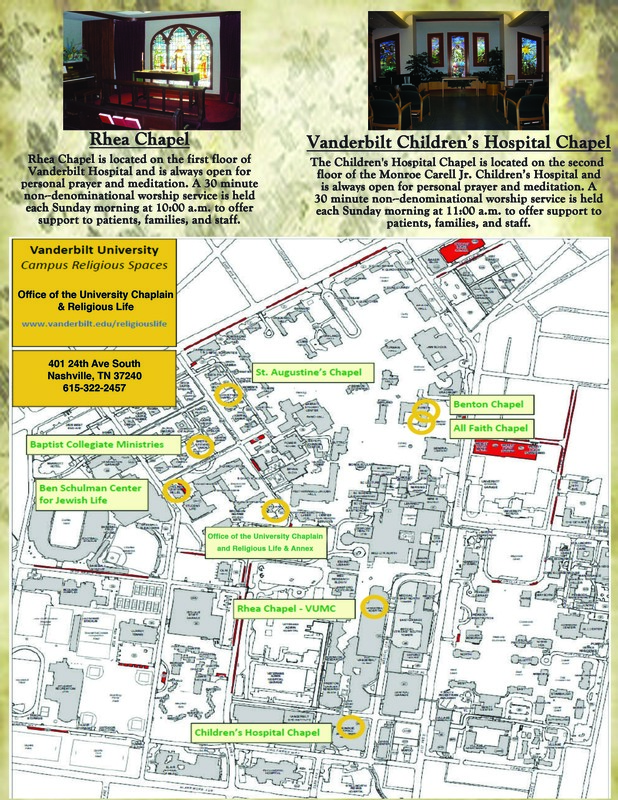 Reservations for Benton Chapel are made through The Office of Reservations and Events. A intimate space with no religious icons. However, there are various ways to control the chapel’s lighting (as “light” is a common religious & spiritual theme). 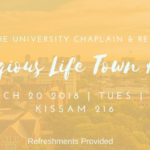 Ideal for smaller weddings, rehearsals, quiet reflection, and religious worship services, The Office of Reservations and Events reserves All Faith Chapel. Chairs should be returned to standard pew arrangement if modified during usage. Failure to do so may result in additional financial charges. Food and drink are not allowed in All Faith, with the exception of sacramental elements. Initiations and rituals restricted to members of private/closed groups are NOT permitted. Initiations and rituals open to the public may be permitted with approval from the Director of Religious Life.